Tanzania’s Northern Circuit is a top destination for great wildlife encounters. Book this 7 Days Murchison Falls Kibale and Bwindi Tour and explore it all and so much more. Day 2: Tarangire to Ngorongoro Conservation Area Authority (NCAA). 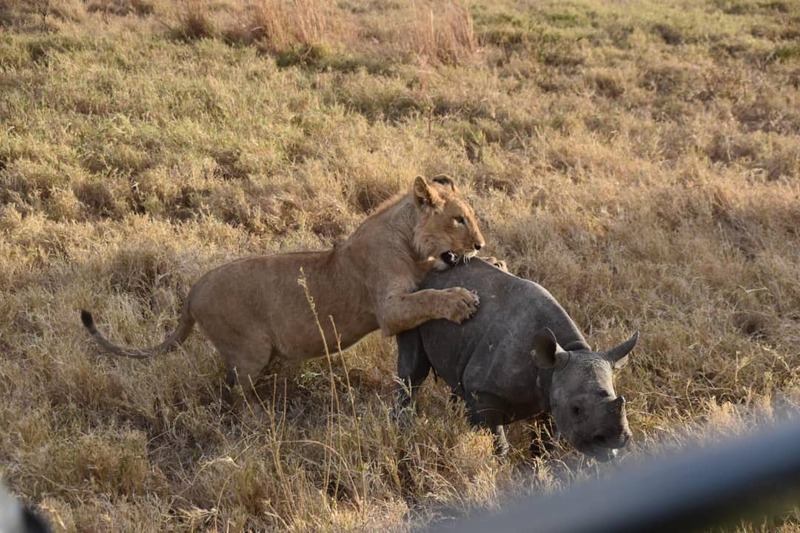 After breakfast, morning game drive of the park and then proceed to your lodge in Ngorongoro. Arrive in time for lunch. PM at leisure. Enjoy the view and surroundings of your lodge. (NgorongoroSopa, Ngorongoro Serena, Lion’s Paw or Ang’ataNgorongoro). Day 3: Full Day Crater tour into Crater. The Ngorongoro Crater is the world’s largest intact caldera (collapsed volcano). Today we descend the 2,000f into the crater by a 4-wheel drive vehicle for a full day safari. Over 30,000 animals live within this enormous natural bowl, the most densely packed concentration of wildlife in Africa. You should see wildebeest, elephant, lion, dik-dik, and wart-hog, whilst on the lakeside there are pelican, ibis and flamingo. Late afternoon return to the lodge (NgorongoroSopa, Ngorongoro Serena, Lion’s Paw or Ang’ataNgorongoro). Day 4: NCAA to Serengeti National Park. After breakfast you will proceed to Serengeti – Visit Olduvai Gorge (Optional), where Professor Louis Leakey discovered some of the earliest evidence of human existence in the 1950s. Continue to Serengeti National Park(Serengeti Sopa, Serengeti Serena, Sametu Camp or Ang’ata Serengeti). Day 5: Full Day Game Drives into Serengeti National Park. The Masai word Serengeti means ‘endless plains’, a perfect description of this magnificent area of over 6,000 square miles. The variety of wildlife in the Serengeti is endless, and on your game drives today you should see the ‘Big Five’ (lion, leopard, buffalo, elephant and rhino) as well as huge herds of zebra and wildebeest. (Serengeti Sopa, Serengeti Serena, Sametu Camp or Ang’ata Serengeti). Day 6: Serengeti to Lake Manyara National Park. Morning drive to Lake Manyara in the Great Rift Valley. In the afternoon there will be a game drive, when you may be lucky enough to catch a glimpse of Manyara’s famous tree climbing lions. (Lake Manyara Serena, Escarpment Luxury Lodge or Manyara Wildlife Camp). After breakfast, drive to Arusha with shopping along the way, arrive in time for lunch and drop off. End of the 7 Days Murchison Falls Kibale and Bwindi Tour.